Does the thought of entering an online engagement ring store bring about heart palpitations? 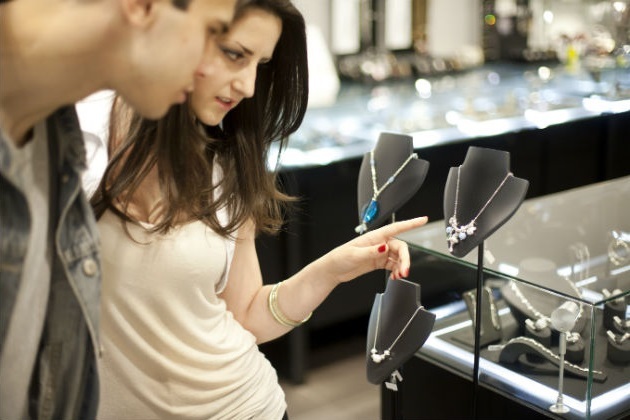 Could it be the excitement of shopping for the most important piece of jewelry you’ll ever own? It certainly can’t be from fear of being attacked by salespeople eager for their next commissionable sale. The point is, even the most sophisticated online engagement ring store won’t leave you feeling like the pressure to buy is hot enough to melt the rings themselves. Let’s look at the offline alternatives, for a moment, as they are wide and varied. Your choices for buying an engagement ring vary from a small antique shop to Costco. Frightening, isn’t it? Not to mention jewelry designers and art galleries. Where does a girl begin? For starters, check out this list of engagement ring retailers which great reviews. So…doesn’t the sound of browsing at your leisure through an online engagement ring store sound relaxing and stress-free compared to the alternatives? Blissfully browsing to your heart’s content at online engagement ring stores does have its drawbacks. There are so many rings to choose from, it may help to know what you’re looking for. Sure, this sounds like obvious advice, but think about it. Have a look at a specialty engagement ring store like szul.com and try to pick just one. If you’re set on a contemporary ring, you can immediately eliminate antique engagement ring websites. Why? You’re probably much more likely to find a contemporary ring that speaks to your heart through an upmarket specialty online jewelry store, like mondera.com, or one of the many online designer websites. At the very least you can begin here and work your way out. This has more to do with the practical side of things, like paying for the ring. Do you need store financing? What about insurance and return policies? All of the (yawn) financial aspects will vary from location to location and should be considered before you look. Otherwise you may find yourself falling in love with a ring that doesn’t fit into the rest of the plan. You can rest assured though that most of the reputable online jewelry stores, like mondera.com or szul.com, have all the financing bases covered. Be firm. Be very firm. Shopping for your engagement ring online is a very emotional experience. You’re looking to find the absolute perfect ring, the one that will make you smile every time you look at your hand, the one that matches exactly the ring you’ve pictured in your mind since you were a little girl. So, at the risk of sounding like your mother and saying “I told you so!” (remember, hmmm?) shopping for an engagement ring is exciting stuff, which could translate into your not thinking as clearly as you might otherwise. Prepare your brain ahead of time. Yes, you are shopping for a ring that symbolizes your love for another person; however, you are also shopping for an investment. If you need to compare your ring to a house mortgage to better work your way through the engagement ring stores, then do so. And remember, that pushy salesperson is not going to try and tell you it may not be there tomorrow because you know when you’re shopping at an online engagement ring store that it WILL be there tomorrow, and probably the day after that too! Give yourself time to think, log off the laptop, go make yourself a cup of coffee. You can crank up the computer again tomorrow – or later on today if you can’t wait another moment – and find that engagement ring store right where it was when you last looked online. Just be sure, really sure, before you make the final decision.